Today, we tend neglect how useful some old-fashioned items are. Wood stoves are one of them. Wood stoves are actually one of the best ways to keep us warm while bringing about a number of benefits such as reducing electricity costs, saving the earth from air pollutants, and more. So, it’s about time that we look at the best, top-rated wood stoves on the market today; shall we? First off, let’s look at this Vogelzang TR007 Ponderosa with Blower. This one is large in size, and thus capable of holding wood of up to 30 pounds per one time. 22” logs are great for this one. 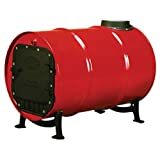 The material used to construct this wood burner is the heavy gauge 3/16” reinforced plate steel and firebrick, making this a durable product that can last for years. It also features a cast iron door, and a large glass window made of ceramic, allowing you to see the mesmerizing fire burning. And, attached with a large ash drawer, removing ash out of this wood stove is a breeze. Per fueling, this wood stove can burn continuously up to 14 hours. It burns very in a very clean manner. No smoke will come out of the chimney. The glass door will always stay clear, and not blacken up. And, this wood stove is easy to operate and control, too. Best yet, the purchase comes with a fan kit, too. Plus, it can also look good for your home décor. 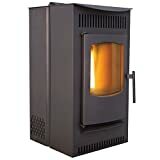 For the price and its outstanding performance, your really shouldn’t miss out on this Vogelzang wood stove. If you’re looking for a medium-sized, high performing wood stove, feat your eyes on this US Stove 2000 EPA Certified Wood Stove. This one is capable of heating up to 2,00 square feet of space and producing the maximum heat of 89,000 BTUs. It can fit 21” logs. With logs of this relatively large size, burn time is longer, yet you will spend less time refueling this stove, too. And, the ash drawer is provided for added convenience in removing the ashes after wood burning. Its glass door comes with the special “air wash” feature, meaning it will help keep the glass clear and the fire view pleasant to watch through the large window. And, along with this wood stove, there includes a blower that is quiet for you to use, too. Besides, featuring a heavy-duty cast iron material, this one has such high durability as well. This US Stove 2000 EPA Certified Wood Stove sure can keep you warm all day and night. 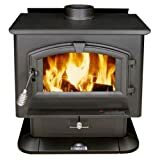 Another top-rated wood stove to look at is this relatively small wood burning stove from Pleasant Hearth. This one is capable of covering the produced heat up to 1500 square feet of space. It is known to have higher than 69.8% thermal efficiency. This stove is not heavy, yet well made and also comes with an automatic ignition. And, this small wood stove features 5 feed rates as well 5 blower speeds, too. Installation is super easy, which should be less than 2 hours long, if you follow the manual provided. In compact size, you can place this guy just about anywhere. The built in thermostat is very smart in determining the needed heat, depending on the outside temperature. The programmable controller lets you set the heating cycle on or off in the most efficient way possible. To clean, you can simply dump the firepot and the ash pan. This one will be a great in addition in your home in the winter times. 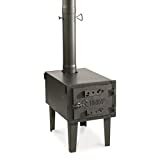 HQ ISSUE Outdoor Wood Stove is another highly recommended wood stove on the list. This small stove is made of high quality galvanized steel and high temperature finish. Thanks to the cast iron and vent holes – its door is very tough and convenient to use. Its overall dimension is 17.75″ x 11.75″ x 16.25″h, 7’10″h, and it weighs about 47 lbs. Its chimney is about 4 inches in diameter. Yet, it is quite heavy duty, and well built. This best wood stove is capable of either heating or cooking. For cooking, it can deal with things like water boiling, cooking bacon and egg, keeping coffee hot, etc. And, for heating, this one is good enough for heating a 10×14 wall tent or a cabin of about 350 square foot in size. If you want to get to your yard, but the cold is stopping you, consider getting this one. This wood stove will get you off the sofa, but on a patio instead with a nice warm heat it can provide you. Reaching the top 1 product on the list today, here we have the US Stove BSK1000 Cast Iron Barrel Stove Kit. 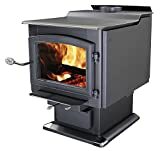 This wood stove is a great option for a saving way of heating a cabin, wall tent, lodge, garage, etc. It is also ideal for using in shops that are as big as 2,400 square foot. Yet, it may not be suitable for using in homes. With the kits and hardware provided, installing this wood stove is very easy. Thus, you can easily transform this 36 or 55 gallon steel drum to a stove effortlessly. And, the quality is great. The burning clay is easy to access. Plus, for the price, you really shouldn’t miss out on this stove kit. This wood stove is basic, but you can never underestimate its performance. There are plentiful of wood stoves on the market today. That’s why it was a challenge for us too, to be able to select the best ones that are top-rated, high performing and can cater to your needs. Now that you have seen all the best wood stoves already; don’t hesitate to get one. A wood stove might be your lifesaver one day.